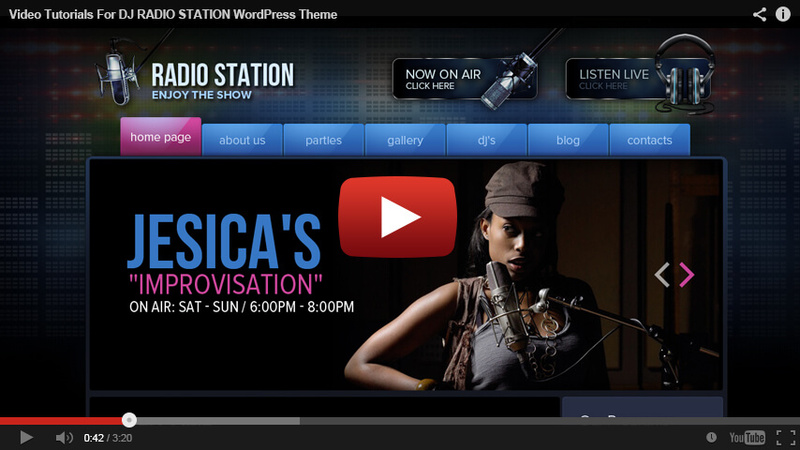 DJ Radio WordPress theme is for people/companies that have a radio station or want to have one! Moreover, if you have your own club or are throwing parties and want to let the people know, this is the template you should be using! It is very easily edible as it is WordPress. It has Admin Page from where you can control all the contents on the website! If multiple pictures, you can change the pages! Write as many articles as you want to and let your people now any news. If you need to customize the design, our team will happily assist you with it as soon as possible! we will create youtube videos for you and upload it here. 1. HOW TO CHECK IMAGE SIZES IN DJ RADIO THEME ? 2. HOW TO CREATE NEW PROGRAM PAGE ? 3. HOW TO CHANGE HEADER ? 3. HOW TO UPDATE OR ADD MENU ? Installing Theme from uploaded file: 237.zip Unpacking the package… I just bought this template...... its saying.......Installing the theme… The package could not be installed. The theme is missing the style.css stylesheet. Theme installation failed. Hello there George? I need a tutorial on the following: 1.) How to check image size? 2.) How to change header? 3.) How to change designs? 4.) How to create a program page? 5.) How to add a photo to the Now on the air tab? 6.) How to change logo? 7.) How to create contact us form? 8.) How to update menu tabs? 9.) How to make the photo now on the air tab so that it changes with the times and days of the shows? 10.) How to add banners to the home page? regarding 3rd question: how to change design? it is possible but need to know php program language. I think you can not do it by yourself its not easy. regarding how to change logo ? logo is here: /wp-content/themes/wp007/images/logo.png Please create same size new logo in .png format and upload by ftp in the same folder where is logo.png file see above. Replace old logo to new one. GM, I didn't see them uploaded yet? hi george what are the info do you need? need following: your hosting cPanel address, username, password, your site URL address and name of folder where would you like to install template. If you would like install it in the root write "root"